The Pan hot/cold TOTE is a Patented dual purpose bag. 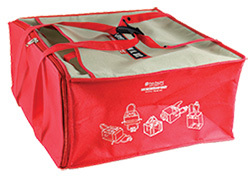 It is a single/multiple box insulated carrier and reusable shopping bag in one. 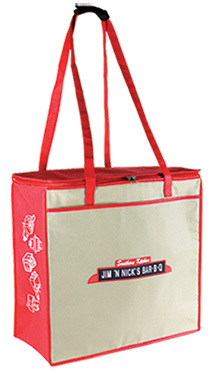 It can turn from a single/multiple box insulated carrier to a reusable shopping bag in seconds! It is a new concept that allows you to easily load and remove multiple boxes from the lateral side opening. This unique multi box carrier keeps your boxes locked-in and perfectly flat. It prevents boxes from spilling out while carrying or shifting when driving in your car. The easy grip handle allows you a free hand to conveniently do other things (carry other items, handle keys, open doors, etc. ).